I wasn't pressurised by the DA: Solly Msimanga - SABC News - Breaking news, special reports, world, business, sport coverage of all South African current events. Africa's news leader. Tshwane Mayor Solly Msimanga took on the mayoral reins in 2016. Solly Msimanga says he wasn’t pressurised by the Democratic Alliance (DA) to vacate the post of Tshwane mayor. He announced he’s stepping down in February to commit more time to his bid to become Gauteng Premier. Msimanga took on the mayoral chains in 2016 with the help of the Economic Freedom Fighter (EFF). His coalition government’s tenure has not been smooth-sailing. It’s been marred by scandals and attempts to remove him by both his coalition partner and the opposition African National Congress. He courted controversy over improper appointments including that of his Chief of Staff and his spokesperson. Msimanga also crossed swords with the EFF over City Manager, Moeketsi Mosola and the multi-billion rand GladAfrica contract. “Yes, there are stories that might be coming. There might be one or two people, possible leaks, but that’s something the federal legal commission is looking into it but that has nothing to do with me leaving the caucus,” says Msimanga. 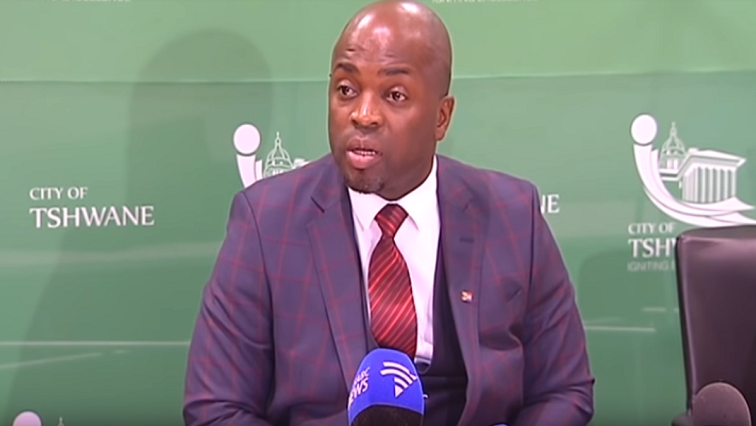 Msimanga says his decision has nothing to do with scandals at the Tshwane Municipality. He insists it’s to advance his Premier ambitions. “I can’t go into a battle and say maybe I will win because I would be accepting defeat, and that is why when I was asked to consider focusing on the campaign I said, ‘Yes! '” says Msimanga. Msimanga will leave office officially in February. This entry was posted on 18 Jan 2019,06:10PM at 6:10 PM and is filed under Politics, News, Homepage Featured Story Slider. You can follow any responses to this entry through the RSS 2.0 feed. Both comments and pings are currently closed.